I've got the Brifter Blues. What are "brifters"? 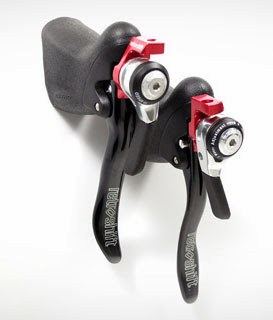 Combined brake levers and shifters. First implemented by Shimano for road bikes in 1990 as "STI" or "Shimano Total Integration", it was pretty cool to be able to shift gears without your hands leaving the brakes -- indeed, while braking. Eventually Campy brought out their own different "Ergo" brifter, and SRAM "double tap" is a third. Now there are made-in-China brands such as Microshift. But brifters, at least the Shimano version, are not perfect. Indeed, the versions I have used in the past 10+ years (5600, 6500, 6600, 7700, 7800) have a way of eventually slicing through the shifter cables. (I have never lost the brake cable, fortunately. The brake cable is significantly thicker, and its motion much simpler inside the brifter). Usually a sliced shifter cable just means a ride home with dramatically reduced shifting (only one derailleur working). And it is possible to fix the gear so you can even get over hills in a decent gear. Randonneurs try to avoid this problem preventing them from completing a long event by carrying a spare shifter cable, to change in a pinch. So on the 29th I did not think much of it when my rear shifter cable broke just as Jerome and I headed down the last descent on Onekansen Doro. Indeed, I thought "great, only a flat stretch between here and home, then I can change the cable and be good to go again." 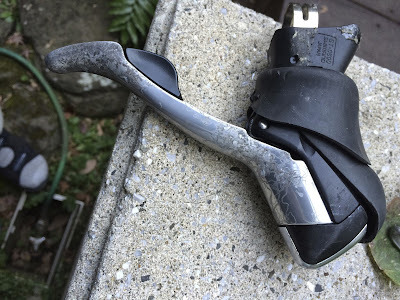 But when I got home, and inserted the new cable (careful to push the small paddle many times before inserting the cable so that the brifter was in the "outside" gear position), ... the shifter did not work. No take up at all when I tried to shift. I tried lubrication (CRC-56) and rethreading the cable (multiple times). I played with the shifter, shook it upside down, etc., etc. No luck. It is non-functional. Just as non-functional as the rear brifter that ceased working last year during Rocky Mountain 1200. These things are very expensive, and there is no way to fix them once they blow up like this. Is there a better solution? Do the newer brifters (6800, 7900, 9000?) work better, with their different routing of the shifter cable along the handlebar under the bartape? As I was heading over the C Speed today, I happened to pass Gunnar riding a beautiful looking cyclocross bike built by Equilibrium Cycle Works, a Shinagawa-based foreign custom builder. He had shifters I had never seen before -- Retroshift CX2s. A better solution? I may need to give them a try! So this seems to be a common problem with Shimano. Personally I haven't had any issues yet, all my shifters have worked fine so far. However, once you shift to STIs with cable routing below the handlebar tape it isn't that easy any longer to exchange the shifting cable. If you want to do you must remove the handle bar tape because it is impossible to get the cable into the housing from the STIs. I just found out the painful way recently. Thanks, MOB. Yes, much harder to change the cable once it runs under the bartape ... though a much cleaner look. As people still have cables break with the Dura Ace 9000 ... I changed the title of the post to eliminate the specific model numbers. 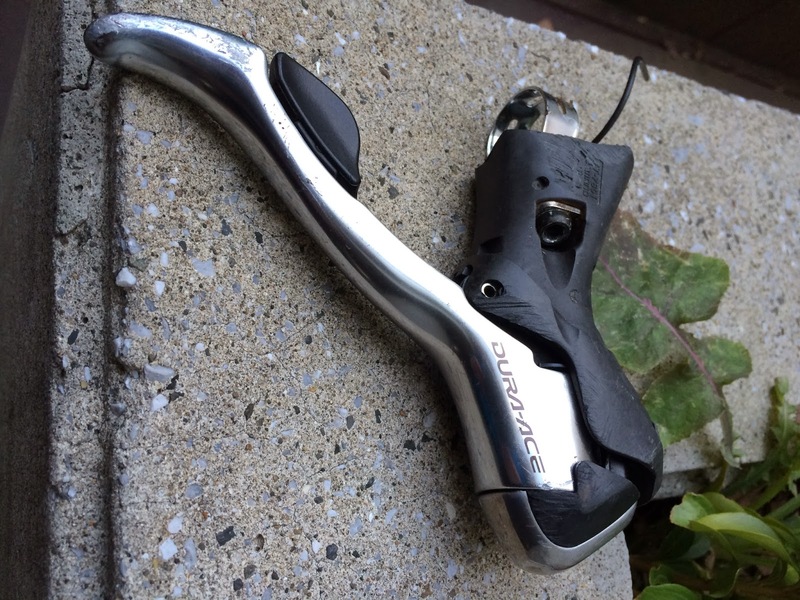 I guess the solutions are (1) electronic shifters, (2) low tech shifters, or (3) other manufacturers -- if Campy and/or SRAM have actually done any better (not sure about this). For me 2014 will be a Campy year. I am in the process of building up a Moser Leader AX frame with Campy 8-Speed Athena/Record group. That bike will hopefully become an alternative to the Canyon with equal speed. Happy new year for you and your family and everybody else from Positivo Espresso worldwide. Do you know why the shifter slices the cable? Are you going to attempt an overhaul? An STI shifter overhaul is way beyond my capabilities ... would need to go back to the factory. Now I am pondering my next step. Retroshift? Or find another shifter used, or give up and go to a new drivetrain as this one is nearing 7 years old? Hiroshi has the Retroshift setup on one of his bikes at C Speed. He used the Retroshift CX2 for the rear shifter, and a downtube lever for the front shifter. That makes sense and is a very repairable, low-tech, inexpensive and lightweight solution. And reaching down for the FD shifts is not going to be as much of a pain as it would be for all shifts. ... but my Canyon carbon frame is not set up for downtube lever, so for me the future is not here yet. This has happened to me also once on each side. It was after quite a few km on the bike though. There is no need to remove the cable housings, though getting the torn parts out of the shifters can be fiddly. It's easiest to exchange them before they are done. Maybe that should be a routine maintenance for every 20,000km? I don't think this is a design fault per se - the cable needs to be bent in a very tight space for the shifting and so metal fatigue is just unavoidable. Maybe a carbon wire would be the most durable solution. The angle for breaking is not quite as strong. I don't know though why the shifter itself would not work any longer - maybe the head of the cable fell into it and is blocking something? Thinking it over, this could be the perfect application for Aramid ropes, which Schindler failed to introduce succesfully in the elevator industry 2000 to 2007.